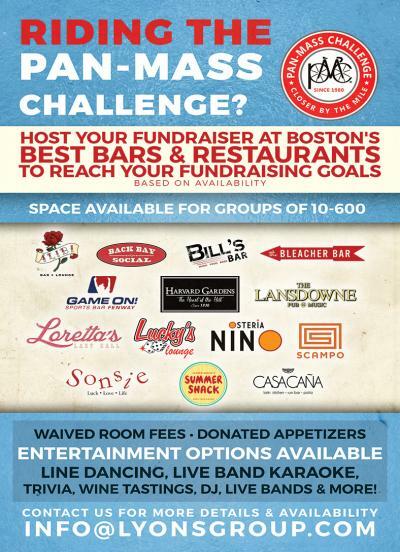 Bleacher Bar (82A Lansdowne St, Boston, MA 02215) - Bleacher Bar will donate $100 in appetizers and waive space fees. In addition, any event over 75 guests, Bleacher will donate a pair of Red Sox tickets! Back Bay Social (867 Boylston St, Boston, MA 02199) - Back Bay Social will donate 3 pizzas per 30 people. Entertainment options available: Board Games, Giant Jenna, Large Projector for slideshows, & more. Raffle Items: $50 Gift Card to Back Bay Social & a voucher for a Social Hour. Harvard Gardens (316 Cambridge St, Boston, MA 02114) - Harvard Gardens will donate space and 2 rounds of 3 trays of appetizers (pretzel sticks, truffle fries and cheese pizza). Entertainment options are available. Lansdowne Pub (9 Lansdowne St, Boston, MA 02215) - The Lansdowne Pub will donate party platters and space. The Lansdowne Pub can accommodate 20-500 guests. Entertainment options available: Board Games, 2x4 Jenga, Darts, Corn Hole in Bill's Bar (depending on the number of guests), & more. The Lansdowne Pub can also assist in coordinating Live Entertainment such as DJ's, acoustic performers, cover bands, and live band karaoke. 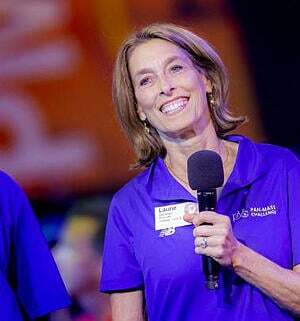 Loretta's Last Call (1 Lansdowne St, Boston, MA 02215) - Loretta’s will donate 3 platters per 30 people (Hushpuppies, Buttermilk Chicken Tenders & Bacon/Pimento Cheese Bites). Loretta’s can also create customized cocktail menus to match the theme of your fundraiser. Entertainment Options include: Live Music, Line Dancing, Patio Games, Patio Party. & more Raffle Items: $50 Gift Card to Loretta’s Last Call & a voucher for a HonkyTonk Happy Hour. Lucky's Lounge (355 Congress St, Boston, MA 02210) - Lucky's Lounge will donate space in addition to 4 platters of stationary appetizers per 25 people. The 4 platter choices are as follows: Chips, Salsa & Guacamole, Roasted Garlic Hummus Plate, Garden Vegetable Crudité, and Buffalo Chicken & Bleu Cheese Dip. Osteria Nino (19 3rd Ave, Burlington, MA 01803) - Nino will donate space in addition to some trays of appetizers. Each tray can feed up to 20 guests. Scampo(215 Charles St, Boston, MA 02114) - Scampo will offer a Prix-Fixe $40 lunch menu. (Not valid on alcohol, tax or gratuity) for up to 50 guests. Monday through Friday from 11:30-2:30PM. Sonsie (327 Newbury St, Boston, MA 02115) - Sonsie can accommodate 45 to 50 people. Sonsie will host a Pizza Party in their wine room where they will donate the pizza and some stationary/passed appetizers. Summer Shack Back Bay (50 Dalton St, Boston, MA 02115) - Summer Shack Bay Back will donate appetizers from their happy hour menu and offer space for two hours in the bar area. Summer Shack Cambridge (149 Alewife Brook Pkwy, Cambridge, MA 02140) - Summer Shack Cambridge will donate some appetizers from their appetizer menu. Shrimp & Scallop Skewer, Lobster Corn Fritters, Sirloin Crostini with Horseradish Creme Sauce, and Vegetarian Stuffed Mushrooms. For seated dinners Summer Shack Cambridge will offer a Prix-fixe menu, 50% of the menu cost will be gifted to the fundraiser (not valid on alcohol, tax, & gratuity). Casa Caña (1234 Soldiers Field Road, Boston, MA) - Casa Caña can accommodate groups of up to 200 guests and will donate space and assorted light appetizers. Entertainment options available.